Go Fish Ketchikan Fishing Charters offers both All-Day Charters and Cruise Ship Charters. If you are visiting Ketchikan for the Entire day or several days, my All-Day and Multi-Day Charters are highly recommended. 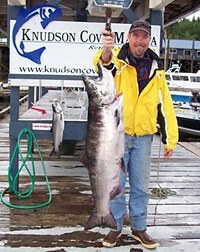 Knudson Cove is the preferred Charter Marina in Ketchikan as it so close to the best fishing grounds in the area. ALL-DAY CHARTERS allow you to set the schedule for your trip. Early morning usually offers the best fishing opportunities, and we should have enough time to fish for both salmon and halibut on the same day, weather permitting. All fishing gear, rain gear, bait, tackle, snacks, soft drinks, and water is provided. Feel free to bring your own. 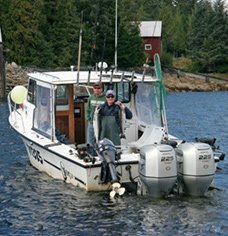 The typical fishing day starts at Knudson Cove Marina at 06:30 and we will return 8-10 hours later. There is a variety of affordable options for processing your catch and getting it to your home. We can discuss all these options and the cost prior to your arrival. (4 person minimum, room for 6). Multiple days of fishing give us the opportunity to fish in different areas and make the most of your fishing and sightseeing opportunities. If you’re visiting Ketchikan for several days book our easy “All-Inclusive Multi-Day Charter” which includes your charter boat and captain. I have taken care of finding the best lodging in our area and will take care of everything. Based on your group size and wishes, I will book your lodging with one of several comfortable, modern options close to the marina. I will make your reservations and deposits based on your schedule. ** Rates are quoted per person and based on double occupancy rooms. There is a wide variety of lodging options close to Knudson Cove Marina. I work closely with several nice properties- all of them a short drive or walk from Knudson Cove Marina. Depending on the size of your group, length of stay and availability I will select the best location for your needs. All locations will have fully equipped kitchens, washer and dryer, internet/phone access, BBQ and a freezer. Please call to discuss any other requests. I can easily accommodate larger and smaller groups or split fishing dates. 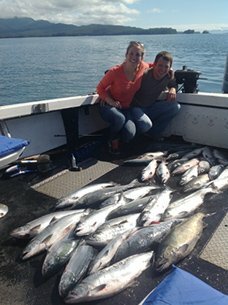 My cruise ship charters are designed to make the most of your fishing time in Ketchikan. 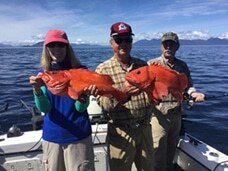 BOOK YOUR FISHING CHARTER DIRECTLY WITH GO FISH CHARTERS KETCHIKAN. I will reserve my boat exclusively for your group. I will personally ensure your fishing trip is everything you hope for. I will be your charter Captain and I will plan your charter with your input. Booking directly provides flexibility in your scheduling for a more personalized trip and more actual fishing time and it’s less expensive! I work with passengers arriving to Ketchikan via all cruiselines including: Princess Cruises, Holland America, Norwegian, Celebrity, Carnival, and Disney. The 6-hour trip gives you 50% more fishing time for only a bit more. The extra fishing time may provide enough time to fish for both salmon and halibut (weather permitting) Having extra time for sightseeing is great. The Ketchikan area has more bald eagles than anywhere in the world, as well as humpback whales, killer whales porpoises and sea lions. We see wildlife on every charter. When your ship docks in Ketchikan, I will have a cab waiting to meet your party at the Ketchikan cruise ship berth. Your cab will take you to Knudson Cove Marina. The scenic, narrated cab ride takes about 20 minutes. Special charter cab rates are available for my guests. The cabs can take up to 6 adults. I will be waiting to meet you at Knudson Cove Marina. The coffee will be hot and my boat will be clean are ready to go fishing. I am an Alaska License vendor and you can purchase your Alaska fishing licenses onboard. The cost for a non-resident one day fishing license is $ 25.00 and King Salmon tags (required when salmon fishing May/June) is $ 15.00. Kids under 16 do not require a license. I ask for a 20% refundable deposit to confirm your fishing date. Deposit is 100% refundable up to 30 days prior to your fishing date. Inside of 30 days, your deposit is refunded if I am able to re-book the date. Your balance is due on the day we fish. 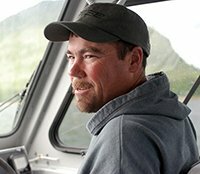 Charter rate does not include Alaska fishing licenses or tags, cab fare to/from Knudson Cove or fish processing. Payment is via cash, personal check or Visa M/C. 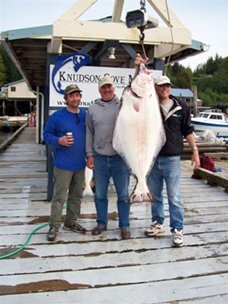 While visiting Ketchikan THE SALMON CAPITAL OF THE WORLD, a salmon or halibut fishing trip is a ‘must do’ activity. This was the most fun 4 hr. charter I can imagine. He even let me clean a fish. Joe is a great guide! I love your new boat, thanks for the the great fishing trip. See you next year in June. I highly recommend GoFish Charters. I’m on the books again for this summer! 407 Knudson Cove Road N.